I forgot to tell you, as I ranted in my earlier post ... that I have sold my Lemon in a Metal Bowl, Capsicum and Butternut Squash paintings this week, as well as 3 of my Gold vases at the Artaboyne exhibiting! So all the hard work is worth it. And it make me smile, a lot! I'll pop more pictures on soon. Do keep looking. Well, I'm slowly making my way with my commission. Its time consuming and I'm feeling rather over whelmed by it at the moment ~ it seems never ending. I know it will suddenly come together, but its not there yet. I can't help but worry... I'm the worlds top worrier! I was thinking, as I was working today, about the Artaboyne exhibition that is currently showing. Which is, by the way, very good and if you are near by take the time to go to see it. Everybody I have spoken to who have been to see it is very impressed by the vast amount of wonderful work displayed, from paintings and photography to sculpture, jewellery and ceramics (of course!). Just before the Artaboyne someone from my pottery class said they had just met another artist (jeweller in fact), who was (as she put it) in a panic about having everything ready in time ~ I said also that I too was worried, but getting there. She seemed really very amazed & said that she couldn't see what we were fussing about or why it mattered so much ... after all it is surely so easy when you know what you are doing! I cannot stop thinking about this comment! AGHHHHH! Yes OK! To the person who does this for a living there must be an element of discomfort, but, it isn't personal you can be detached. What if, you had to strip off buck naked and do this ... I guess that most people would think twice at this point? Now how about if every single person decided to say there thoughts and frankly say exactly what they were thinking, then there, you just about have it! Of course you would be nervous and unsure. It would be only natural. Everybody is an art critic. Everybody has a point of view. I am selling a little bit of me; I am selling something that I have physically made and REALLY thought about. After all if who ever buys a piece and takes it home they have give you the thumbs up. That is the approval, the thumbs up and appreciation of what I have made that I work for, and helps me to earn my living ... so I have to get it right. Does this make any sense to you? Am I spouting off ... don't answer that one! Funny how such an innocent comment has really rattled my cage. I think, because I'm so stressed about the commission, the studio gallery being open 7 days a week, that fact that I have NO time for my children at the moment and it is their summer holidays (weather not helping) I have put this out of proportion. But, I am frustrated that they think living the life as an artist is easy... its not... it is great most of the time, but sometimes is F*#king tough too and I wish more people could see that. Maybe my ranting will change someones perception about what happens, I don't know! But, I feel better for that! Ahhhh. Breath out and smile Emma ... Tomorrow is another day... Hope you have a good one too! I have been telling you all about my BIG commission for so long and not posted anything yet. Well today, you will be glad to see, is the day! In the picture to the left, you will see a pillar with the stove/fireplace enclosed, which I have been asked to tile all around. Each tile is approximately 11" x 8" with smaller tiles for the top and bottom of the pillar. They have been especially made to size. It took me a good few weeks to find somebody who was able to do this for me, but now they are finally here. The piece is taking its inspiration from the Willow Pattern and a wonderful set of tiles I came across that the clients really liked too. So, I am painting the "Tree of Life" in a wonderful Persian blue/green with a plane cream background, then in and around the tree I will be painting animals insects and flowers in their true colours. It should look very striking and will certainly be the centre piece for this amazing Eco friendly house and home. I started by wrapping the pillar in paper and sketching out my ideas. I then laid out the sketch onto the floor and traced the image so to work onto the tiles with more ease, see the image above right. Its a lot of fiddling, lifting and replacing the traced image up and down, on and off the tiles to see if it is all correct... but I've done it. Phew! 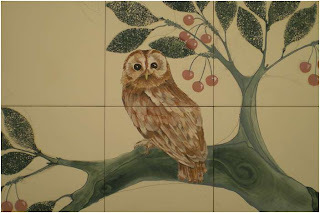 See below the two samples or the Robin and Owl. 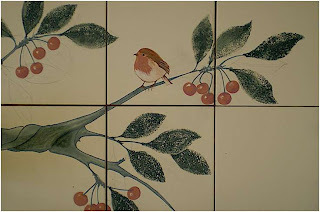 They are not fired or glazed at this point and are on 8"x8" tiles rather than using up they special ones. Well that is all I can show you for now! I am working in the attic with our roof rabbits (mice!) for company, as they are better that the girls walking over them. And, it is the only space in the house that I can work on the image as a whole with peace and quiet. I'll post more images as I progress, so, keep watching........ ! Tomorrow I am handing in ten pieces of work for the Artaboyne Exhibition. I've worked my socks off getting them ready for tommorrows deadline. I'll be very pleased to hand them over.... But I'm feeling rather nervous... or should I say unsure... because, I have made ten pieces in my "Gold" range ~ this will really test the market! I love them. They are so striking AND they have REAL gold on them tooo! BUT, I don't know what it is, but I have a horrid feeling that they are too... how can I describe them... too... ummmm.... too dark? And certainly not every bodies cup of tea... well it seems more like a mega tea-pot at the moment! But I think the darkness is part of their beauty. I think they are sleek, stylish and rich like dark chocolate melting in your mouth once you have opened that golden wrapper... except this time the gold is the hidden treasure just peeking out. Oh I hope they like them. If you happen to be in the area, do pop by. It is at the Victory Hall in Aboyne, the private view is this Friday evening 7 - 9pm and then open daily 10am to 8pm, from Saturday 14th July for 3 weeks, until the 7th August. It should be a fantastic show ~ it certainly boasts its high standards, so don't miss it! I'll post the photos of them tommorrow, once they are handed in. I'll be more relaxed then! See you soon! I've just heard that 2 of my trio of platters sold at the private viewing evening for the Deeside Artists Exhibition. I'm so chuffed, because, I so nearly didn't put them in at the last minute! Funnily enough, it was the Butterfly Platter and the Robin Redbreast Platter that sold, which I wasn't expecting to sell first. I am rather fond of the bumble bees (as well as being secretly proud of them) and so I thought that the Bumble Bee Platter would be the first to be sold. What's even better ... is that I have heard (through the gossip line) that a gallery loves them and wants me to put together an exhibition ... but I don't know who yet! They will have to wait ... a little bit! So much to do and so little time, of course! So, I must stop typing and go see my children, as the holidays have just started and I want to spend time with them this summer ... even if the weather is rubbish and it's nearly supper time!!! I'll post again soon with more images ... so keep looking! 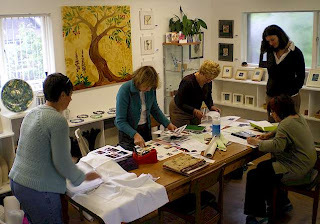 Here is my sister-in-law, Annabel teaching her very successful textiles workshop (Annabel is at the head of the table facing us) here at Platform 22. The class had to extend an extra week as the group were enjoying the course so much! Each person made wonderful pieces using photographs, sewing, materials and so much more, from fabric books to fabric framed mirrors. Each piece held a significant meaning or memory to those attending. I haven't seen the finished works, but Annabel said they were all beautiful and so eclectic. 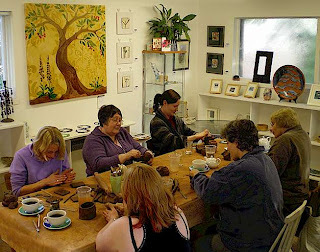 Here is my Tuesday pottery workshop hard at work... happily beavering away. I'm not pictured, as I am the one behind the camera! I really enjoy the classes from my studio, they are relaxed and the conversation always flows. Classes at Platform 22 are very different from the classes I hold anywhere else, I presume its because I'm at home, in my studio and so my approach is that bit more relaxed... who knows! As you can see everyone is very comfortable. People feel they can just dabble, or experiment, or try something more elaborate and there is no pressure. I think with all the artwork around on the studio gallery's walls, that people find it an inspiring atmosphere, so they can express or create something much more easily. I am always on hand to help, guide and teach ~ but generally I never have to instruct! But, I also find that the class all help each other out too, which is lovely. If you are interested in any of the classes, or workshops I offer from Platform 22, please email me or leave me a message and I will send you more details. 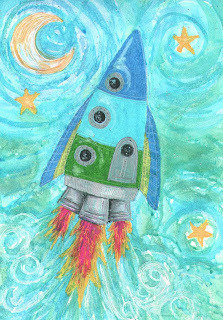 "Zoom Zoom" is a picture I did for a friend's little boy, it is a mix of wax crayon, oil pastel and water colour. I had such fun playing with the image, letting my imagination run away with me... well just a little! After drawing the rocket in oils I started scratching into the oil pastel for texture, with my daughters wax crayons I then added swirls all around it, and last of all, with a wash of colour to create a lovely night sky ~ which is deep and soft yet full of movement. It is just a simple picture, but a nice piece just right for a little 4 year old boy. I went onto have fun playing with the image on the computer which you can see below, so "Zoom Zoom Zoom!" is now a wonderful girlie pink too! 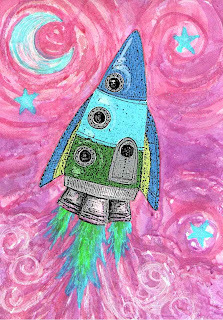 I now sell prints and cards of my rockets flying to the moon, so if you are interested please email me. Bumble Bee Platter. 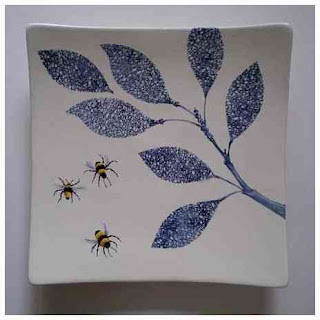 Slip cast earthenware platter decorated with three bees using under glazes. Butterfly platter. 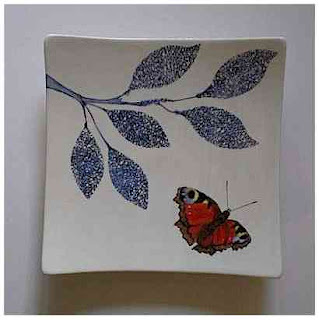 Slip cast earthenware platter, decorated with a butterfly using under glazes. 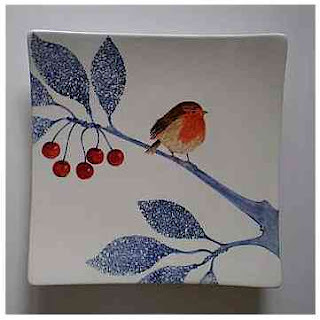 Slip cast earthenware platter decorated with a perching Robin using under glazes. Here are three platters I have just finished making for the Deeside Artist Exhibition at Banchory. If you are in the area and would like to see them (as well as the other exhibiting artists! ), please visit the exhibition ... it runs from Thursday 5Th to Sunday 15Th July open daily 10am to 6pm. 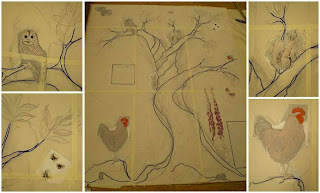 Each image is taken from the large tile commission I am currently working on, which is inspired from the willow pattern combined with the Tree of Life. These pieces are not only art pieces in their own right, but art in the making ... as I am working out composition and colours, as well as gaining confidence before I start the commissioned piece. I will post some more images of the commission as I progress with it ~ next week I will be launching into the massive job of sketching out the layout onto the tiles from the preparatory sketches, which are in themselves rather large.